Linux Celeste (1.2.6.1) in 27:04.43 by Buhbai, DevilSquirrel, EuniverseCat, fishmcmuffins, KDT & keylie. 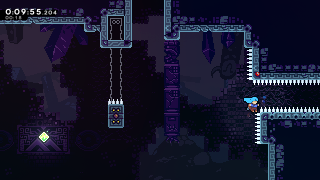 Celeste is a platform game released in 2018 and developed by independent game studio Matt Makes Games, who also developed TowerFall Ascension. It features Madeline, a young girl who sets on a journey to reach the summit of the titular mountain. Can she survive the many dangers that await her on her ascent? Buhbai, DevilSquirrel, EuniverseCat, fishmcmuffins, KDT and keylie reach the summit of the mountain in record time, attaining an in-game time of 23:15.224.